A row over plans that a discount European airline, Norwegian Air, has to start flying to the US has recently broken out here in the colonies. 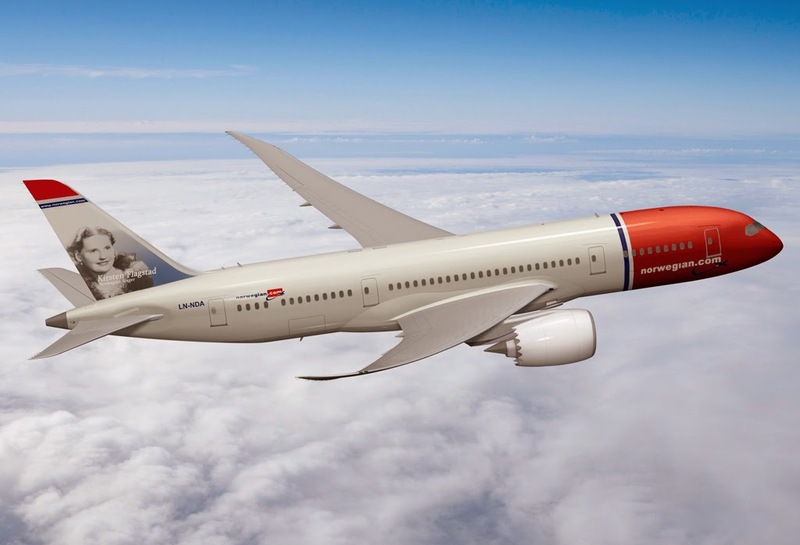 Norwegian Air, the third largest discount airline in Europe has recently announced an expansion across the pond to several new US cities. Incorporating as Norwegian Air International in Ireland, the company has drawn the ire of US airlines and trade unions on both sides of the Atlantic for what they perceive as unfair business and labor practices. While the EU has created a common aviation area, it remains unclear which regulatory, tax, and labor laws apply to aircrews who may work aboard the aircraft of an airline headquartered in one country, be employed by an entity in a second country, be based in a third nation, and fly routes primarily out of a fourth. I have to say that given the crushing thicket of rules, regulations, restrictions, and taxes that any airline must negotiate to make a profit, this arrangement (if true) seems rather clever. Personally, I think that the US union's time and effort would be better spent on reducing barriers to commerce here and abroad rather than working to impose those barriers on a smart competitor. Now I'm no expert on bi-lateral agreements between the US and the EU, but it appears that Norwegian Air could avoid all this trouble by simply changing the name of their Irish unit to Irish Air and then getting on down the road. They would, though, still have to compete for passengers, recruit and train crews, and still operate their aircraft in accordance with both US and EU safety standards. And speaking of crews, there still is apparently a worldwide pilot shortage which we've noted before. The commercial aviation markets in both India and China are exploding and there is a continuing huge demand for experienced transport category pilots. Unions continue to be the bane of airlines worldwide, and one mechanism that many overseas airlines utilize to avoid the establishment of pilot unions is to not actually hire any pilots. Consulting firms are created which hire pilots on a contract basis, usually for periods of three to five years to staff the airline. If after the contract period is up and the airline likes you, you'll be offered another. If not, sayanora. While Norwegian does maintain a website listing pilot requirements for new hire pilots, their jobs opening website has no pilot positions offered. Most curious until a quick search reveals the site of aviation consultants Rishworth Aviation who are "eagerly seeking" Boeing qualified pilots for placement at Norwegian flying brand new Boeing 787s. In this way airlines can avoid the "ratchet effect" of ever increasing but never decreasing wage rates of unionized carriers. Asian airlines have used this practice for years using consultants such as Air Charter Service and Iasco to provide American pilots to airlines like JAL and All Nippon. But getting the pilots is the trick, isn't it? How many type rated and current Boeing pilots do you suppose are just sitting around the house waiting for a call to go to work flying for Norwegian? My guess is that there aren't many (who aren't already working somewhere). How does one go about becoming a qualified Boeing pilot anyway? I happen to know. Many years ago, to apply for my current job, I actually had to purchase my own type rating (which is an FAA designation to fly a certain type aircraft) for a 737. Boeing 737s can actually be rented for about $50...a minute. Cheap, right? So the whole deal was only about $10 grand. The 737 is Boeing's smallest airliner and a type on say a 777 would be unobtainable to most private citizens except wealthy dilettantes like John Travolta. Plus, this gets you the basic rating but no experience. The point is, most pilots walking around with those types of ratings had them paid for by the airline they worked for. This means that Norwegian is hoping to raid the cadre of other airlines, and that means they have to offer a better deal. There are many US pilots working overseas in hell holes such as the UAE and India who do so because they've been either laid off from a bankrupt US carrier, or perhaps got a late career start and don't wish to join the bottom of a union seniority list. They go overseas to fly in a lousy place for the pay. It will be these pilots that Norwegian will be trying to attract. And they'll have to compete on pay. It isn't uniformly accepted that low-fare competition is inevitable on intercontinental routes, though. "You cannot pack people like a sardine can," Qatar Airways Chief Executive Akbar Al Baker told reporters in October. "I don't think it will work." Among the challenges to the discount model on long routes: Many cost-saving techniques used by short-haul operators can't be replicated. Discount carriers like Southwest Airlines Co. LUV +0.08% and Ryanair Holdings RYA.LN -1.89% PLC, the U.S. and European leaders, try to get planes unloaded and back in the air quickly. That is harder to do on intercontinental flights, which face more departure restrictions. Southwest, America's putative low cost leader is having it's own problems, as the short haul market is collapsing and the long haul market is mature and populated by newly merged mega-carriers with freshly reduced labor rates due to post 9/11 bankruptcies. If Norwegian manages to build a better mouse trap, then bully for them. They might find though that when flying the same airplanes in the same skies as their competitors, any competitive advantage is fleeting.